Although international friendlies often hold little significance, those in the run-up to a major tournament can often give you an important glimpse into how each team will set up during the tournament itself. Thursday’s friendly was significant as it was between two of the favourites to win the Euros, as well as being a repeat of the final of Euro 2012, a match in which Spain outclassed the Italians. This match, however, was a different story completely and proof of Spain’s decline since the aforementioned victory. Italy were missing Andrea Barzagli and Marco Verratti, both of whom I would expect to start for Italy this summer if fit, as well as forward Ciro Immobile. Spain were without the glorious Sergio Busquets who was relieved of national team duty due to a broken finger. The starting line-ups. 3-4-3 for Italy and an asymmetric 4-3-3/4-2-3-1 for Spain. I’ve decided to start with the positives of the match from a tactical point of view. Conte has got Italy playing very effectively. Without even taking the lesser quality of their players into account, they controlled Spain in all aspects, being miserly in defence and making progress up the field in attack with ease. 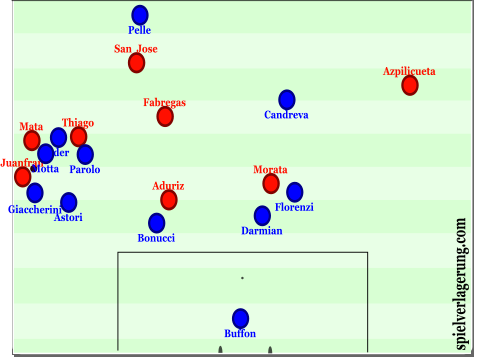 Conte’s use of wingbacks, something Juventus became famous for in his time coaching them, flummoxed Spain. 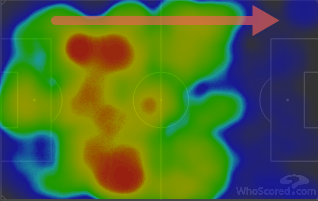 The wingbacks moved up the pitch with the ball and stayed wide at all times, finding themselves in acres of space and helping to stretch the Spain defensive block. 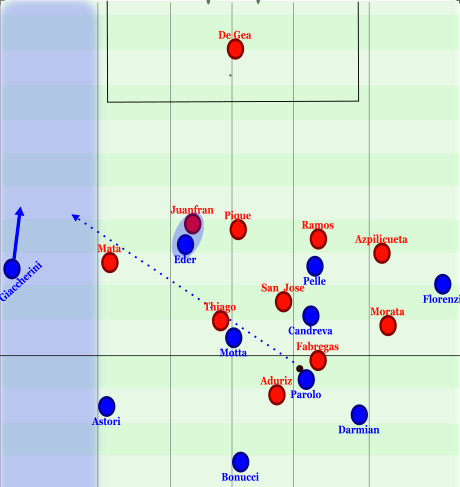 Just like he did at Juve, Conte uses wingbacks to create superiorities on each horizontal line of attack. He then uses one-pass switches of play, usually carried out by Pirlo, to exploit the space they were in. 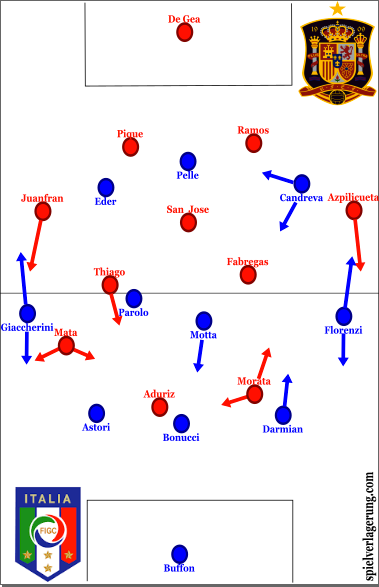 Italy’s wide centre-backs positioned themselves in the halfspaces during their possessional build-up play. This means that, once they receive the ball, they can play a vertical pass into a forward or into an overloaded area or alternatively, they have good access to all areas of the pitch, meaning they can switch the ball to the wingback on the opposite side of the field. 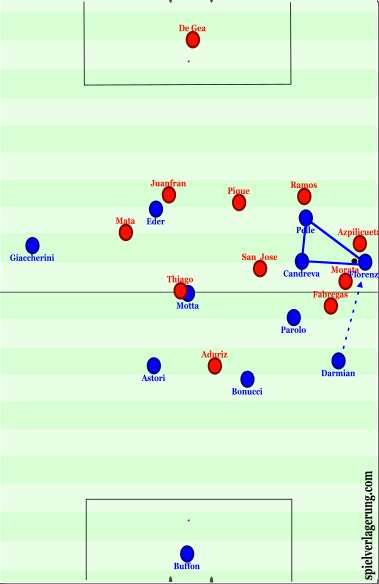 The main tasks of Italy’s wide forwards (Candreva and Eder) during the match was to support the wingbacks out wide as well as make runs in behind the Spain defence. Above, we can see how Astori, with the ball in the halfspace has Florenzi in lots of space on the right flank to play it to. Candreva is also in the right flank to first; make sure Azpilicueta cannot close down Florenzi and second; to give Florenzi support when he receives the ball. 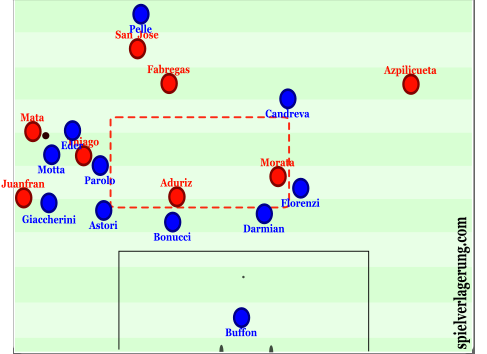 Astori plays a lofted pass to Florenzi who can control it in space, and link with Candreva. Candreva runs with the ball infield, looking to play it into Pelle before it is cut out. Italy’s wide centre-backs were vital in their build-up play. The heatmap shows this. They used Astori and Darmian to dominate the halfspaces in early possession, giving them good ball access to all areas of the field. 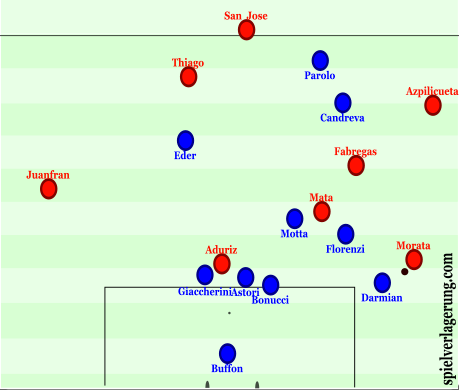 The second way in which Italy accessed their wingbacks was through the wide centre-back on the same side of the field. 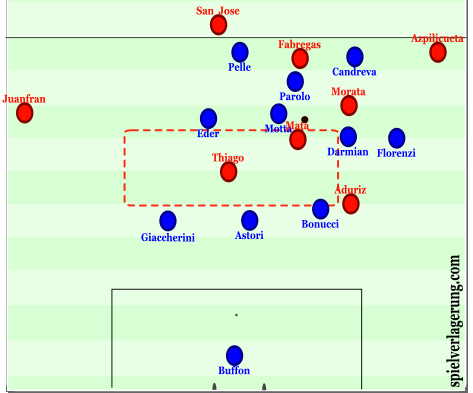 Italy would simply use the quantitative superiority of their back three to switch the play with short passes along the back, and then play a vertical ground pass from centre-back into wingback to exploit the space up the wings. As I mentioned previously, the wingback would then have support from Eder or Candreva as well as Pelle or a central midfielder. Darmian plays to Florenzi who has immediate triangular support from Pelle and Candreva to allow Italy to access the halfspace and centre in behind Spain’s midfield line. 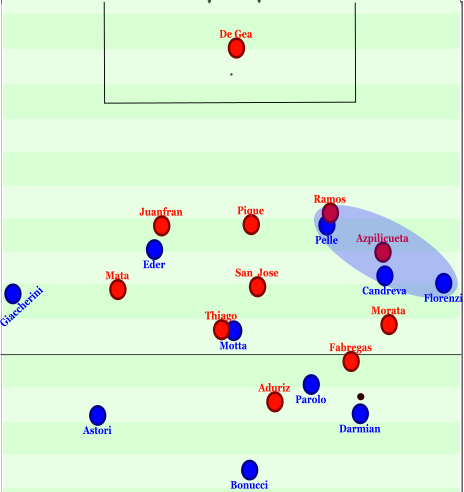 Italy also used the fact they were using wingbacks as well as wingers to create overloads in wide ares, helping them to penetrate Spain’s defensive line. Darmian has the ball in the right halfspace. Italy have created an overload on the right flank with Pelle moving onto Ramos and Condreva moving onto Azpilicueta. This leaves Florenzi free. In this situation Darmian would often play it into Florenzi however this time he decides to play to Parolo who has access to play the long pass into Giaccherini who is along on the left flank. Notice how, even though Italy are focused towards the right of the pitch, Eder stays in the left halfspace occupying Juanfran. This is was gives Giaccherini the space to run in to. 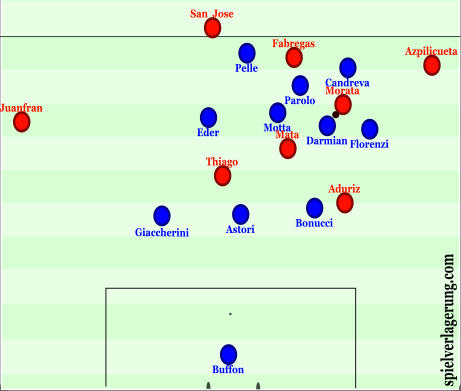 Italy built up play from very deep using their centre-backs and occasionally Buffon. They used this deep build-up not merely as a way to keep the ball from Spain, but their whole attacking strategy was based on it. In the first half (before substitutions were made which would complicate the statistics) 133 of Italy’s 294 passes came from their three centre-backs. This is equivalent to 45.2% from just 27.3% of Italy’s eleven players. Compare this to Spain’s centre-backs (18.2% of the 11 players) who made only 21.8% of the team’s first half passes. Italy used their three centre-backs to keep possession very deep in their own half, with Spain finding it impossible to press them effectively. They used intelligent passing play and good structure to pass it around Spain’s attempt to press and exploit the space in behind the press. Spain pressed using their six midfielders/forwards while keeping a narrow back four who were forced to play a high line. Spain’s back four were isolated against the three Italy forwards. 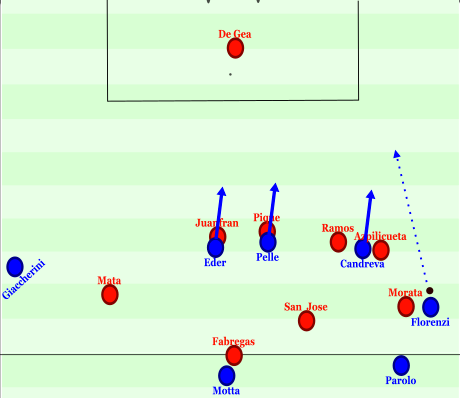 Italy used their wingbacks as outlets who then played passes into the large space behind the Spain defence for their three forwards to run onto. In the above scenario, Italy have used their centre-backs and Buffon to move it past Spain’s press. Florenzi has burst up the right flank with the ball at feet and he knocks it past a rapidly retreating Spain defence. In possession, Spain were nothing short of dreadful. Their first shot of the match came in the seventieth minute which was the header that should have been declared offside which rebounded to Aduriz who scored. Their only other shot came in the 83rd minute and was a weak Morata attempt from outside the penalty area. They played in the dreaded tiki-taka U-shape, moving the ball from fullback, through the midfield, to opposite fullback. Their aim was possible to find pockets high up the pitch out wide and then play quick combinations however this was completely ineffective due to Juve’s brilliant wide coverage in their 5-4-1 defensive shape. Spain’s structure was non-existent and their passing was far too slow and aimless. Spain could have mirrored what Bayern did against a Juventus 5-4-1 last week and play crosses into their robust forwards Aduriz and Morata however only played 10 crosses all match. In the second half, they brought on Koke at left-midfield, with Morata moving to centre/right forward and Thiago playing in the right halfspace. Morata and Aduriz would switch positions however this had no effect. Spain did become slightly more dangerous when they brought David Silva on in the 71st minute and played 4231 with a more central focus. As it is hard to highlight Spain’s slow passing and poor rhythm graphically I’ve decided to provide you with a trio of examples of Juan Mata’s dreadful awareness, something I discussed on twitter during the match (@flyingwingback). Above, Mata receives the ball in between the lines in a lot of space. 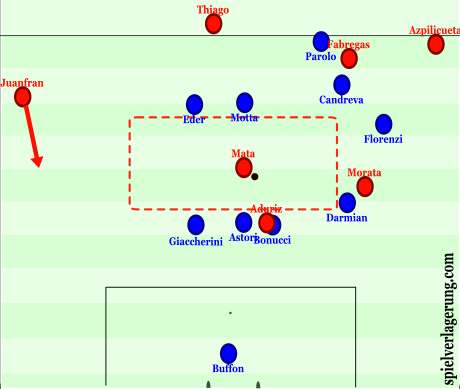 Instead of bursting into the space ahead of him and looking to shoot or slide a ball through to Aduriz he takes four small touhces, allowing Italy’s midfield to recover and plays a pass out wide to Morata. Mata receives a pass from Fabregas. He doesn’t look over his shoulder and has no clue of the dangerous space behind him. Instead of turning with his first touch, or looking for Thiago, he takes a heavy touch back towards his own goal and plays a slow pass to Morata who is immediately tackled. Mata has the ball on the right flank. It is pretty clear where the dangerous space is. He can access it through a pass back to Fabregas or San Jose or alternatively a risker pass into Thiago. Instead, he plays the easy pass wide to Juanfran who is at a dead end and Spain become boxed in and lose the ball. Conte will be encouraged by his sides’ performance and his tactics. 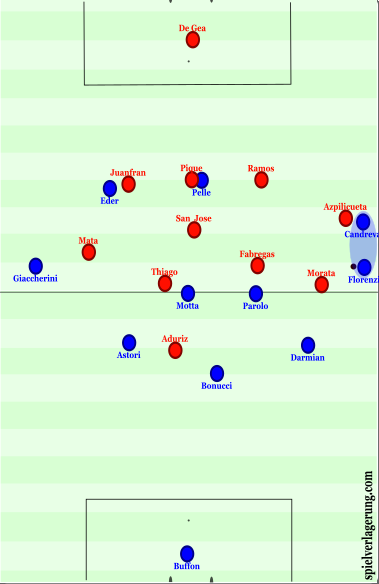 Once they eradicate the problem of leaving lots of space in between the lines at times, and also maybe improving Italy’s access to the centre of the pitch in the final third, they will become serious contenders to win the tournament. His only concern will be Italy’s lack of strength in the centre-forward position. 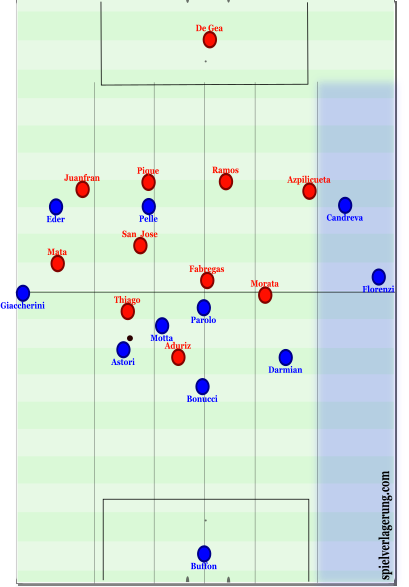 Spain really need to improve their attacking structure and tempo if they are going to avoid a fate similar to what they experienced at the 2014 World Cup. Having Busquets in the side will give their attack some direction but they’ll have to rely on the brilliance of individuals to overcome their opposition.